Atomic Fireball Candy a hot, spicy Cinnamon flavored jawbreaker. Wow! Zing! Lip-smacking good! Whatever it is that your mouth experiences when you pop in an Atomic Fireball, this is simply one of the best hard candies available today. Its hot, spicy taste gives you a bit of a wake up call that energizes your next half hour or so. This candy packs a powerful wallop into a single sphere of hard goodness that simply tastes delicious. Atomic Fireballs are round and red. Plus, they have a cinnamon flavor. This hard candy goes back to the 1950s when it became quite popular. When the product was presented to the industry, the capacity at Ferrara Pan was limited to only 200 cases per day. Today an estimated 15 million fireballs are consumed per week by people all over the world and the number continues to grow. 150 count atomic fireballs per jar approx size is 3/4". The Atomic Fireball was created in 1954 by Nello Ferrara. He wanted a spicy hard candy that he thought would catch the attention of candy lovers. Packaged originally in an attractive yellow and red box, the Atomic Fireball was advertised as a hard candy with a red hot flavor. The creators of this tiny treat did not expect it to catch on with such intensity, but people were passionate about their candy and the Atomic Fireball quickly became a hot seller. All candies have their secrets- top secret ingredients, clandestine candy-making processes, hush-hush flavorings, and more. The good candies also have the secret to a successful shelf life. Atomic Fireballs are made using the hot-panned candy-making process. Starting from a single grain of sugary goodness, Atomic Fireballs are tossed like the fiery hotcakes they are into revolving pans to create the finished product. Throughout this unique process, flavorings are added along with coloring and special ingredients. The process takes days since each ingredient is added one tiny bit at a time. 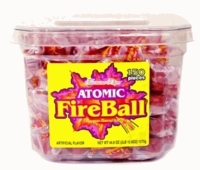 Of course, the most important reason to choose Atomic Fireballs for your first pick when it comes to buying or eating candy is the simple fact that they taste good, other reasons do come to mind. Atomic Fireballs offer a zing to your mouth that not only wakes up your taste buds, but also wakes up your energy level. The spicy goodness of this particular hard candy masks the telltale sign of a stale mouth. Plus, the fiery hot taste immediately takes over so they are great for getting rid of unpleasant tastes in the mouth. Atomic Fireballs are sold in packages of all sizes from small, one-serving pieces to huge tubs of these round, red candies. Unfortunately, due to their decidedly hot, spicy, cinnamon flavor, this is a hard candy that most people either like or dislike. My friends and I used to take a wagon and head out to the alley's around town, looking for discarded pop bottles. If we were really lucky we would find a wagon load of them and haul them to the grocery store to turn them in for money. Once we had that money in one of our hot little hands, we made a mad dash up the street to the penny candy store. Oh, what joy it was to look at all that candy!! The atomic fireballs were my favorite, and I also loved the wax bottles full of liquid candy!. We would pick out as much candy as our money would allow...which often took forever...I can still see the lady rolling her eyes at us! After receiving our bounty in a brown paper sack we made our way to the tree house in my friends yard. Once there, we all sat Indian style and divided up our stash. We'd lay back and enjoy all that candy and talk and laugh.